Hamburg has proved to be a stubborn nut to crack. Very stubborn. During the last few years of writing this blog, I've been tackling various locales, people and objects, trying to deepen my own understanding of the role they played in the story of German spy, Josef Jakobs. Most of my blogs have focused on the English side of things, mostly because it has been easier to dig up information on those places and/or people. 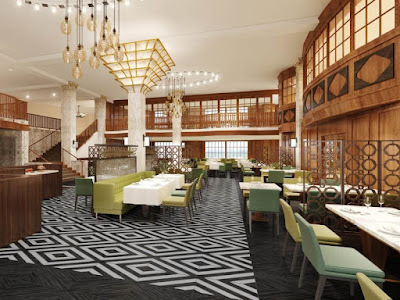 I've tried several times to dig up info on some of the Hamburg hotels/restaurants/meeting places that the 1940/41 spies and Abwehr officers would have frequented. On the whole, the internet rebuffed my efforts. Given that Hamburg was bombed to smithereens in the latter stages of the war, this might not be altogether unsurprising. Maybe some of those locations ceased to exist? 10th Army Corps and the Abwehr. The General Kommando building was designed by the architects Distel and Grubitz and completed in 1936. It's a typical Wehrmacht style, massive and imposing, with a couple of eagles looming above the entrance. It housed the General Command of the 10th Army Corps. Since the Abwehr was a intelligence arm of the Wehrmacht (German Army), it too was housed in this building, apparently in the west wing. After the war, it was used by the British Security Service. At least it all ran in the intelligence family! Later, the building returned to the Wehrmacht but in 2014, they too vacated the building. Perhaps it will be turned into apartments. This building no longer exists. 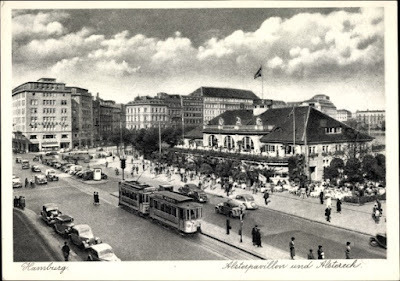 It was located at the corner of what is now Walburgstrasse and the Alsterglacis. Apparently the Abwehr housed several spies in this Pension (essentially a Bed & Breakfast or Boarding House). I haven't found anything that would indicate Josef spent any time here. As mentioned in the previous blog on Vera, this was the address listed as the residence of Vera von Wedel on her 1946 Hamburg death registration. Ah, the infamous Phoenix Hotel! This was apparently a hotbed of Abwehr agents. Double-agent TATE, during one of his controlled radio transmissions to the Abwehr from England, asked the Abwehr officers to pass on his greetings to his friends at the Phoenix. When Karel Richter arrived in England, he claimed that the Abwehr officers suspected TATE was under control. The mention of the Phoenix in a radio transmission deeply disturbed them. There is no evidence that Josef spent any time at the Phoenix but apparently Karel Richter did. Today, there is still a Phoenix Hotel at the same address. While the building has changed a little (particularly the top floors), one can still see the same window shapes, a nice sense of continuity with the past. Can we say impressive? 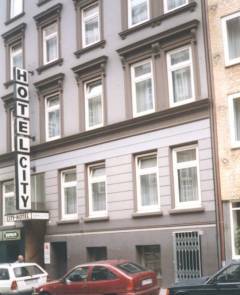 This was the hotel where Josef Jakobs first stayed when he came to Hamburg. It was rather posh, I have to say, which is in keeping with Josef's character of "keeping up appearances". Nothing but the best for our man. It was from this hotel that Josef ventured forth to begin his training as a spy in late September 1940. He stayed here for only one month however and, in late October 1940, moved into the more humble Hotel Sorgenfrei, just around the corner. Perhaps Josef discovered that his pockets were not as deep as he thought! 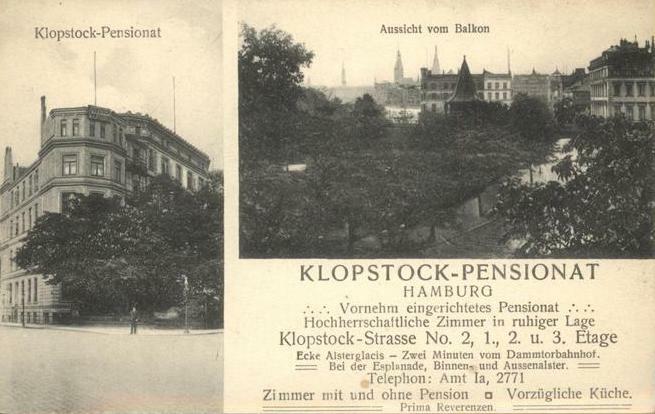 I managed to dig up a few interior postcards of the Hotel Reichshof. Posh was right. 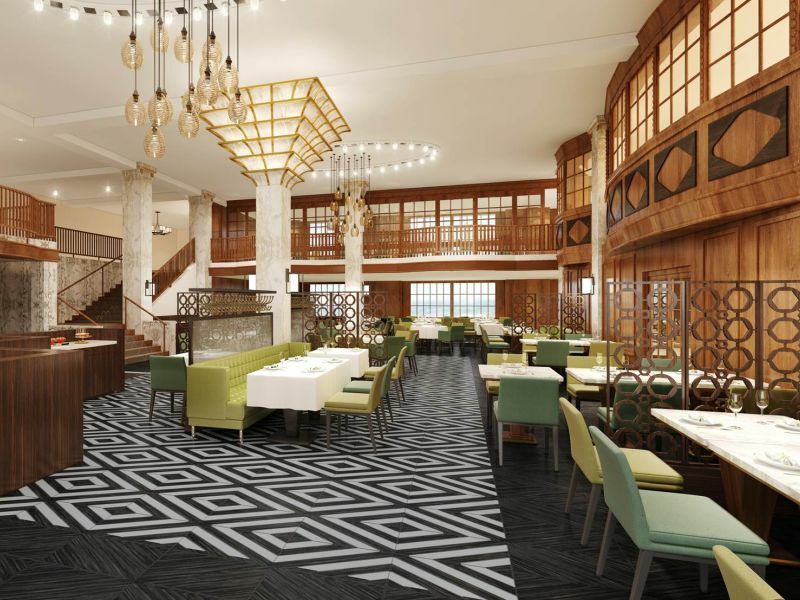 It would appear that the hotel escaped the worst of the war damage for the interior today is still glamorous and posh. Today the Reichshof is run by Hilton and you can stay here for about 200E/night... and up. This hotel has proved to be a b*** to find. I eventually discovered Hamburg City directories on Ancestry.co.uk and dug around in them. 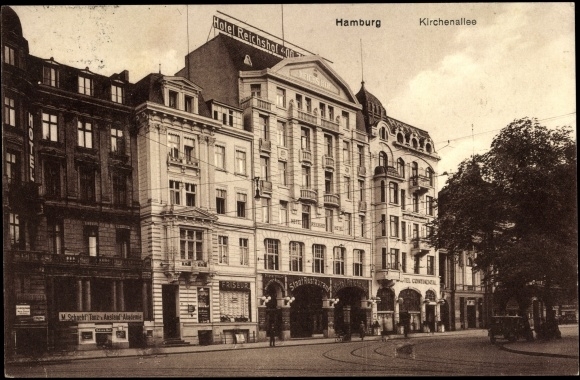 I found a Hotel Sorgenfrei on Kapellenstrasse 22 (Hamburg 1 district- which meant the core of the city) but the only Kapellenstrasse in existence today was in the far eastern suburbs of Hamburg. Skipping forward to the 1950 directory, I found the same hotel, but this time at Ellmenreichstrasse 22 (also Hamburg 1). Most likely another case of name changes after/during the war. 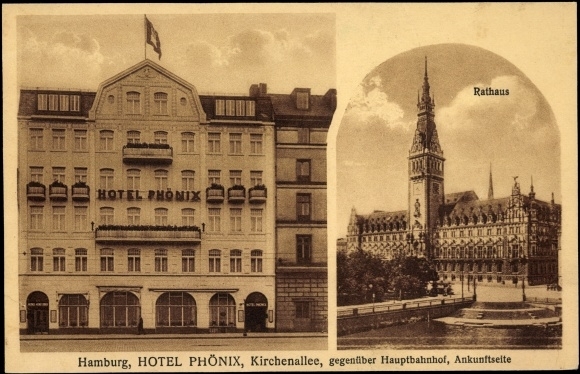 Despite all my research, I haven't found any postcards of the Hotel Sorgenfrei, probably because it was a tiny place. Today, there is still a hotel at that address, albeit a small one. The location is just a block off Kirchenallee, basically around the corner from the Reichshof. This was the hotel to which Josef moved in late October 1940. It was probably a fair bit cheaper than the Hotel Reichshof. 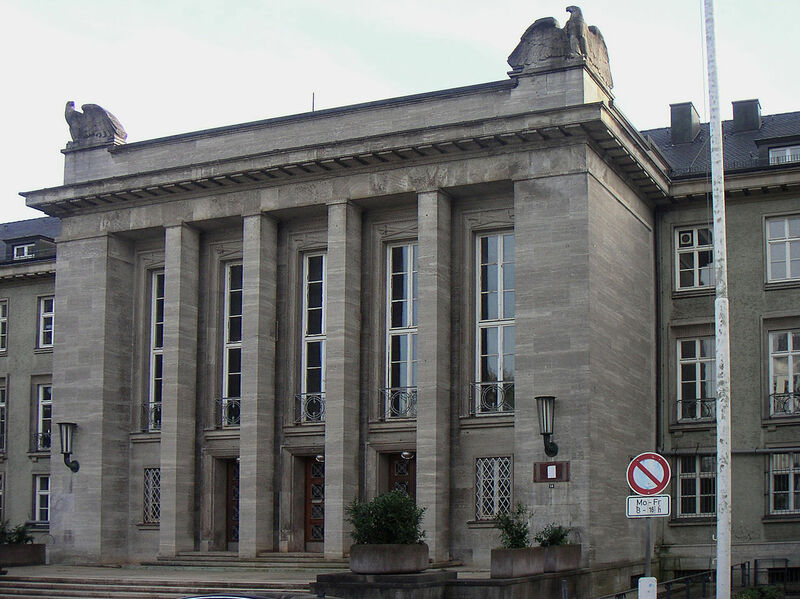 After Clara returned to Hamburg from an orchestra tour in late November 1940, she moved into Josef's rooms at the Sorgenfrei and presumably stayed here until he departed for The Hague in early January 1941. Ah yes, the infamous Cafe Dreyer. This was the locale where Josef and Karel watched Clara perform with the Bernhard Ette Orchestra. It too proved difficult to pin down. Some references had indicated it was located in the main train station, which was heavily damaged during the war. Luckily, the Hamburg city directories proved useful here as well. Cafe Dreyer was listed and its address was simply... Bieberhaus. Turns out the Bieberhaus is a massive building just north of the main train station. It was built in 1910 on the site of a former school. One of the school headmasters had been named Dr. Theodor August Bieber and the new building was named in his honour. It housed the Bieber Cafe, one of the best coffee houses in Hamburg. 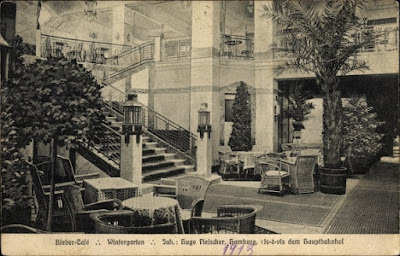 In 1933, the Bieber Cafe gave way to the Cafe Dreyer, also known as Dreyer Ahoi. The locale became well known as a coffee house and dance salon. No wonder that Josef spent many an evening here. It was across the street from the Hotel Reichshof and a short block from the Hotel Sorgenfrei. Today, the Bieberhaus (no relation to Justin Bieber) still stands and houses a variety of shops, the Department of Finance and, the recently moved Ohnsorg Theater. The building underwent fairly significant renovations to accommodate the theater which apparently occupies the former location of the Cafe Dreyer. For those with a bit of German... one of the Hamburg radio stations presented a 30 minute history of the Bieberhaus which was quite fascinating. During the episode, a couple of the older Ohnsorg theater patrons talk about the Cafe Dreyer and the big dance hall in the Bieberhaus. The Alstereck is a large building located across the Inner Alster Lake (Binnenalster) from the main train station. Today, the building houses several businesses, including Nivea. 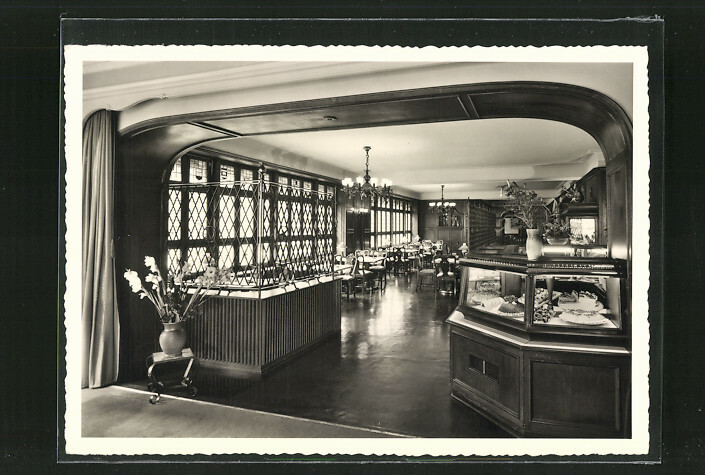 Back in 1940, it housed several coffee houses and restaurants. Josef and Clara apparently came here quite often to eat. It would have been a nice stroll from their hotels in the vicinity of the train station. 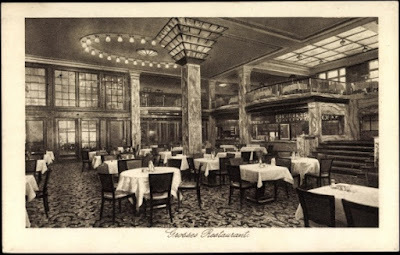 The Alstereck was quite posh and had several restaurants to entice prospective patrons. According to Josef, he and Clara came here so frequently that any of the waiters/stewards would recognize Herr Jakobs and his lady friend. In the interests of clarity, I've added all of the above locales to an interactive Google Map. They are indicated by the red markers. I've also added a few residential addresses for Nikolaus Ritter and Julius Jacob Boeckel (green squares), the two Abwehr officers with whom Josef and Karel seemed to have the most contact. The blue circles mark several of the cover addresses for Abwehr correspondence. There are many others, but these were the ones that had some connection to Josef. Architecture Tour of the NS Time in Hamburg - has a piece on the General Kommando building.